We create clean, accessible, responsive, and efficient websites and web based applications built specifically for the client's needs. Our goal is to build an extension of your company on the web that is cohesive with your established identity. 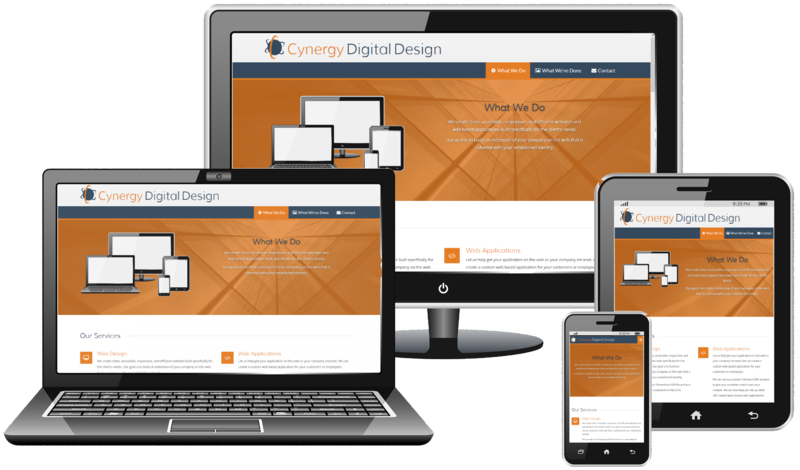 We create clean, accessible, responsive, and efficient websites built specifically for the client's needs. Our goal is to build an extension of your company on the web that is cohesive with your established identity. We can take your Photoshop PSD file and turn it into standards compliant XHTML/CSS. Let us help get your application on the web or your company intranet. We can create a custom web based application for your customers or employees. We can set up a custom Orchard CMS solution to give you complete control over your content. We can also help you set up other .NET based open-source web applications. We strive to help the client establish a complete visual identity. We approach logo design from a perspective of clean lines and simplistic shapes. Our philosophy is, less is more. We can also incorporate your logo into business cards, letterhead, fliers, banners, etc. We help you establish your brand across all media. We provide high quality robust interactive instructional self-paced courses that can be loaded to your intranet, made available on CD’s or can be uploaded to your Learning Management System. Courses can be made SCORM or AICC compliant for scored quizzes depending upon your needs. Male and Female narration talent is available as well to really enhance the learners experience. Job Aids and Visual Guides can also be made as downloadable PDF companion files. We deliver professional presentations that capture audience’s attention while delivering your companies message for internal or external communications. Handouts, Job Aids and Visual Guides can also be made as companion materials. We can edit and convert your corporate videos and presentations into streaming videos that can be available on your customer website or packaged on a DVD or Flash Drive for marketing. We offer various original compositions that can be used in your presentations and eLearning modules for that additional pizazz. Audio mixing and editing is also available. There are no set prices for a logo or website. We will discuss your needs with you and give a quote based on those needs and the time frame required for completion of the work. Our goal is to provide you with a cost effective solution. Coast 2 Coast Electronic Recyclers, Inc.